Minnie (Breuninger) Schumm, Zion Lutheran Cemetery, Schumm, Ohio. This is the tombstone of Wilhelmina “Minnie” (Breuninger) Schumm, located in row 7 of Zion Lutheran Cemetery, Schumm, Van Wert County, Ohio. The marker is inscribed Minnie Schumm, Aug. 26, 1860-Jan. 28, 1899. Minnie was the fourth child of Louis and Maria (Seckel) Breuninger, my great-great-grandparents. 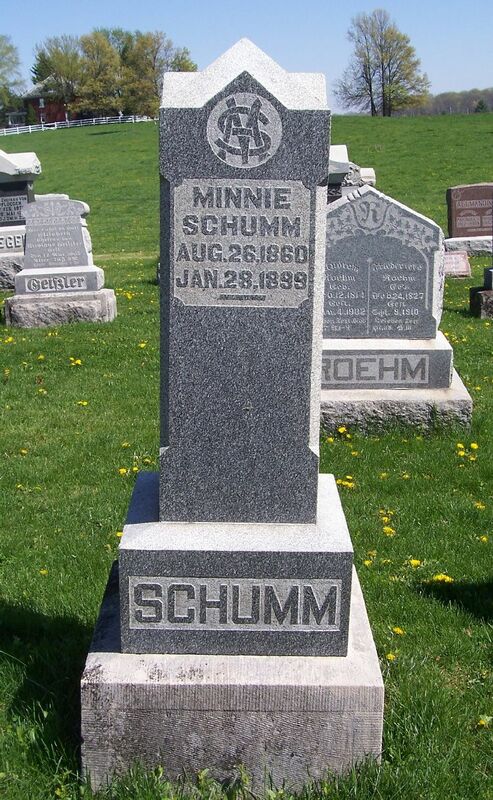 According to the records of Zion Lutheran Church, Schumm, Minnie was confirmed there in 1875. She married Johann Schumm on 18 November 1880 at her parents’ home. Both were from the Schumm parish. 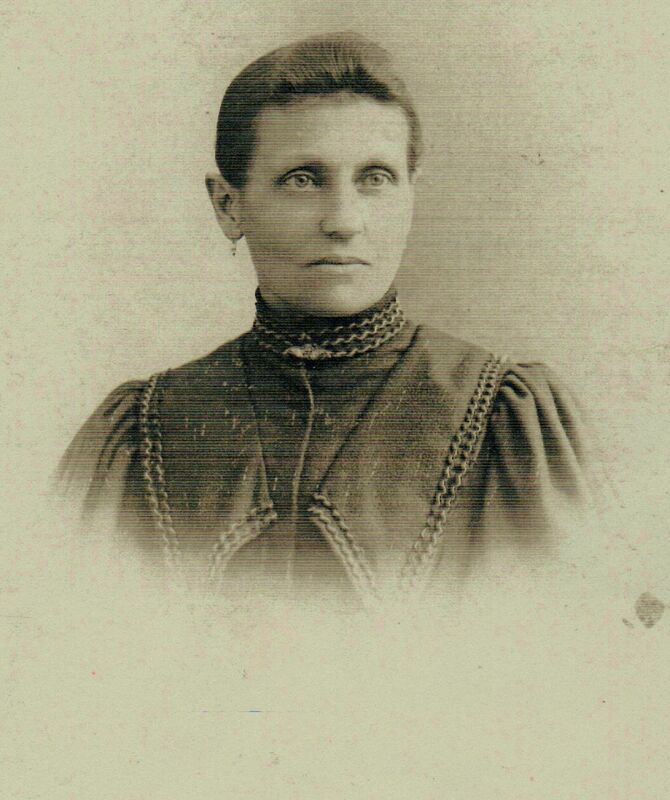 Her death and burial was also recorded in the church records: Wilhelmina Schumm, born Breuninger, wife of Mr. John Schumm, was born 22 August 1860 in Green Bay, Wisconsin. She died 28 January 1899 of consumption, age 38 years, 5 months and 6 days. She was buried on 31 January 1899 in the parish cemetery. The funeral text was Hosea 6:1. Wilhelmina Schumm, daughter of Lewis and Mary Brenninger [sic], was born August 22, 1860, at Green Bay, Wis., and died January 28, 1899, aged 38 years and 5 months. In ’67 the family moved to Atlanta, Ga., and after a short time came to Willshire Township where they have since resided. November 15, 1880, she was united in marriage to John Schumm. To this union was born six children, Victor, a manly lad of 17 years, twin daughters, Hilda and Lydia, 15 years, then Lizzie and Arnold, and last a little daughter, Salome, who is now 6 years of age. This is indeed a sad case. For over three years Minnie bravely fought disease, trying to regain health and strength, to be with her family. A part of these years was spent at the Toledo Hospital. Some nine weeks ago, word was received that consumption, fell destroyer of all hope, had set in and medical skill was of no avail. Then willing hands and loving hearts responded quickly, the doors of Mrs. Lewis Schumm, and affectionate sister, were thrown open, that the children at home might not be overburdened with care and that they might not remember the sufferings of the dear mother who so loved and cared for them, who so longed to live for the sake of husband and children. You mothers who sit at fireside and table with your children happy and contented, will never know the look of inexpressible joy and contentment that flashed over the face of Minnie when she learned that she was going home, “home to friends, to mother, to children, the dear children and to John, my John.” She was of a loving disposition and in the last nine weeks of her life there were many days of sunshine and pleasure. The end was free from suffering and she passed peacefully and quietly out into the great unknown. Funeral services were held at the German Lutheran church, Tuesday afternoon, January 31st, by Rev. Seemeyer. Text, Hosea, 6:1. Minnie is indeed “At rest,” the tired hands are crossed, the frail body is at ease, and the sensitive spirit has returned to the God who gave it. Repetition of the Lord’s Prayer soothed her like a benediction, and “forgive us our debts as we forgive our debtors” seemed to be a favorite line. “We miss thee from our home, dear mother. Mrs. Lewis Schumm, the sister with whom Minnie spent her last days, was Sarah (Breuninger) Schumm, my great-grandmother.